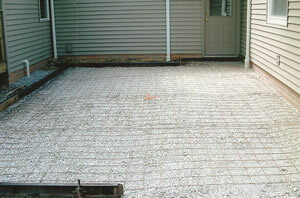 Saint Louis Metal Work is one of Northeast Saint Louise’s leader in the placement of stamped concrete, driveways, foundations, footers, poured walls, basements, slabs, patios and more. We have the experienced staff to handle any of your concrete needs. One of the newest and hottest trends in landscaping is stamped concrete. With the availability of a large selection of patterns, colors and textures available this new concrete technique is making it easy to get the brick, wood or stone look you want without the worry of frost-heave or grass growing between the cracks like in pavers. The look is achieved by pouring a concrete slab for a driveway, patio, walkway, etc. Through the use of color, pattern, and texture, a design is created in the concrete before it fully sets. 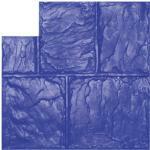 There are many new patterns available in stamped concrete including brick, wood, pavers or cobblestones to name a few. Our experienced staff will be happy to assist you in selecting the pattern, color and texture you are looking for. Contact us for a free consultation. These are just a few of the many stamp designs to choose from. Saint Louis Metal Work are experts in the installation of concrete for driveways, foundations, footers, poured walls, basements, slabs, patios and sidewalks. Experience cannot be stressed enough when dealing with the installation of concrete. You can have the best tools available, but if you do not have an experienced team performing the concrete placement many problems can arise. From the base to the placement of the concrete, Saint Louis Metal Work makes sure that every aspect of your driveway, patio or foundation is completed to specifications. Don’t like the look of the same old gray concrete? Pigment colors can now be added to concrete, giving driveways, walkways, patios, and garages a whole new look.We have the excavating equipment to handle the big jobs as well as the small. Saint Louis Metal Work is a full-service general contractor and construction firm. We are also proud to be a member of the American Concrete Institute (A.C.I). Let a professional handle your concrete needs. Contact us for a free consultation. We will be happy to discuss your concrete needs.